Hednesford Town gave Gloucester City some early Christmas cheer following an afternoon of gifted goals which saw The Pitmen crash to a 5-1 defeat away from home, writes Scott Smith. 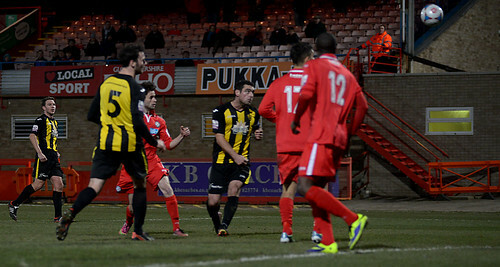 Things certainly didn’t look as if they would end this way though, with Town very much starting on the front foot. In just the third minute Jamey Osborne was able to wriggle his way to the byline and his cross was met by Wayne Riley who saw his flicked header hit the post and rebound away to safety. Hednesford continued to push forward in the opening ten minutes as they searched for the first goal and they almost found it when Elliott Durrell was able to create space for himself at the back post, but his driven effort hit Greg Pearson and went behind for a goal kick. This would be the best it would get for the visitors though, as following a good save by Dan Crane from Marcus Giglio they would fall behind in the 13th minute when midfielder Darren Mullings was able to win possession and play a defence splitting ball which saw Zak Kotwica round Crane and slot home despite the best efforts of Darren Campion on the line. It nearly got worse for Town in the 18th minute, only for Campion to scramble an effort away off the line but just five minutes later it was 2-0. Francino Francis’ clearance struck Conor Waldon and the ball fell perfectly for Mullings who was able to slot home from close range. Hednesford were now desperately trying to find a way back into the game, however, with a resolute Gloucester defensive performance they were restricted to long range efforts, with Kris Taylor seeing a 25-yard drive go just over the bar. Ten minutes into the second half and Town had a half chance to reduce the arrears when substitute Neil Harvey headed wide at the back post with his first touch of the ball. The game was virtually sealed for the home side just three minutes later though, when they grabbed a third goal. Waldon picked up the ball on the right-hand side of the box and his speculative shinned effort looped up and over Crane and into the net. 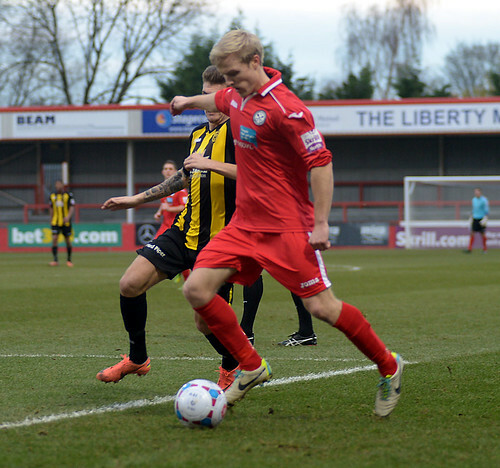 Hednesford didn’t fold though and within five minutes they had managed to snaffle a goal back. Substitute Nathan Woolfe had only been on the pitch for a matter of minutes before he was able to head home from Durrell’s right-wing cross in the 64th minute. For the next 15 minutes the home side were firmly camped inside their own half with Town applying pressure on the City goal. Any chance of an unlikely comeback was soon put to bed though in the 80th minute. An unmarked Will Morford had all the time he wanted to back-heel the ball home from inside the six-yard box, past the helpless Crane to make it 4-1. 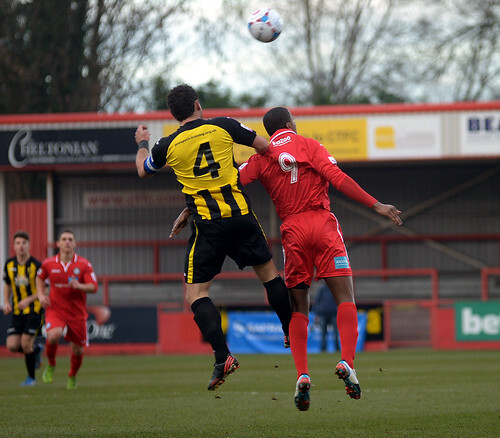 Despite this, Hednesford continued to push forward and both Osborne and Campion went close to a second for The Pitmen. However, it certainly wasn’t meant to be their day as in the dying embers of the game Morford was left unmarked down the middle of the pitch and he was able to delightfully lift the ball over the advancing Crane to put a gloss on what was a convincing victory for the hosts. The Pitmen will have to pick themselves up as they return to league action on Tuesday evening when Harrogate Town visit Keys Park with a 7.45pm kick off.